Red Barn Yarn is a new thread and yarn company, specializing in hand-dyed colors in what they call “tonal solids.” Because the owner does needlepoint they have a lovely needlepoint yarn among their offerings. The three-ply wool is available in either 8 yard skeins or 162-yard hanks (4 oz). You can see samples of all their colors on their site. Like most knitting yarn companies the color range is small, about 40 colors, but they are lovely. Theresa from Homestead clued me into them and I’m so glad she did. I used the thread on two recent pieces, the quilt block and the kimono, reproduced below. THe kimono was stitched in Continental and the color variation is slight. The quilt block is stitched in Milanese and there is more variation, but not as much as most overdyes. It almost seems like a faded old-fashioned look. I enjoyed using this thread. One ply gave thick coverage on 18; it would be perfect on 16. It really shone in the loner stitches of Milanese. It covered easily and was so much fun to use. Unlike older kinds of Persian, all the threads were the same thickness, so there was no waste. Wool is so fun to use for stitching, but it has become less popular in recent years, which is a shame. Recent supply problems of various kinds have made it even harder to find. 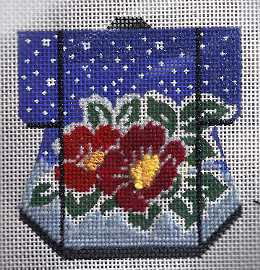 But it’s worth seeking out and Red Barn’s Persian will make simply lovely needlepoint.